Humble Pie is a cocktail that’s far from modest in flavor. Find out how Sean Hoard (the bartender who created this recipe) became inspired from a classic American dessert. Discover other holiday cocktails in our collection of original recipes from the top bartenders across the nation. Combine the first seven ingredients in a stirring vessel and add ice, stirring until the ingredients are incorporated and the mixture is chilled. Strain over fresh ice and garnish with candied ginger (when available). To make the ginger syrup, soak raw ginger in warm water and peel it (the back of a spoon works really well). Run peeled raw ginger through an extractor. Strain ginger juice and add sugar. Stir until incorporated. To make the demerara syrup, boil water and then remove from heat. Add sugar and stir until fully incorporated. 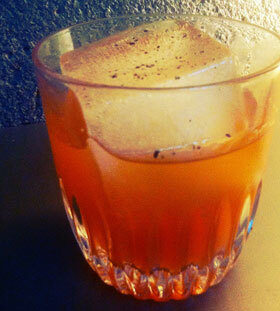 For apple brandy, Sean Hoard (the bartender who created this recipe) uses Bonded Lairds Applejack. For Scotch whiskey, he prefers Famous Grouse Blended Scotch and for bitters, he suggests Angostura Bitters.